Retirement is a great time to try new things. For one reason or another--academics, work, child raising, finances--we practically never went to plays, except for a few notable exceptions way off Broadway in New York. At those performances we knew the playwright and the producer and some of the actors, which lent a special tension to our enjoyment of the evening. Now that we are here in Las Cruces, we are taking advantage of senior discounts and a lively local theater scene. So far, we have sampled various programs at the Rio Grande Theater (Minds Interrupted); and plays at the Las Cruces Community Theater (When You Coming Back, Red Ryder; Steel Magnolias), and the American Southwest Theater Company at the new Center for the Arts at New Mexico State University (Our Town; Picasso at the Lapin Agile). NMSU's Center for the Arts doesn't look much like the other buildings on campus, and it generates plenty of public comment for that reason. For such a large building, the size of the theater itself is surprisingly small and intimate. The rest of the building is used for classrooms, rehearsal rooms, and costume storage. I am a big fan of the NMSU theater itself. 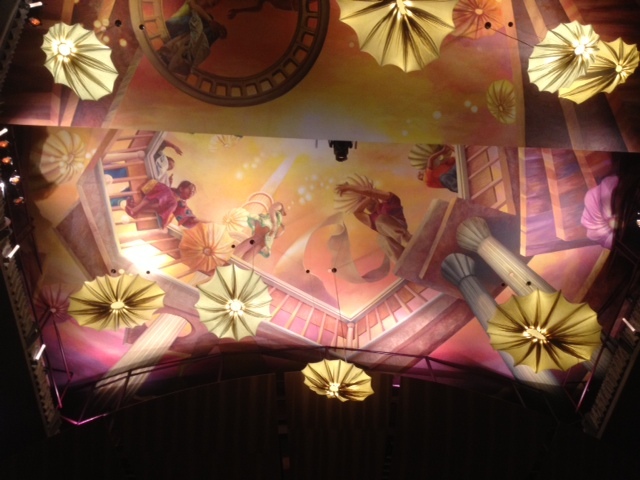 The photo above is of the ceiling, which is several stories above the seats, and which seems to stretch far beyond. I believe that it is somewhat magic--the first time I saw it a couple of months ago at its opening night, the painted figure seated on the left was "painting" something more; this time there was a parasol over the paintbrush hand and the figure of a woman in a skirt has now appeared. I love the way the parasol light fixtures hang down into the space below the ceiling, while more parasols--painted ones--appear above. And the painted pillars and balustrades mimic those below in the theater itself, which contains balcony after balcony. Oh, yes. The play--Picasso at the Lapin Agile, by Steve Martin--was very funny and we enjoyed it immensely. But the theater! Now, that was the real star to me.